Unveiling: August 14, 1932, 3:30 p.m. The unveiling coincided with the golden jubilee convention of the Knights of Columbus, who gave dedicated the statue and presented it to the United States. Approximately 20,000 members of the Knights of Columbus and other Catholic organizations turned out for the parade and the dedication ceremony. The unveiling of the statue to Cardinal Gibbons was broadcast on the national radio network. President Hoover addressed the assembly and accepted the statue on behalf of the United States. Martin H. Carmody, supreme knight of the Knights of Columbus, presented the memorial, and the Most Rev. John M. McNamara, Auxiliary Bishop of Baltimore made an address. The unveiling was performed by a grandniece of the late cardinal. There was also a papal delegate at the ceremony, the Most Rev. Peter Fumasoni-Biondi, who delivered the invocation and blessed the ceremony. 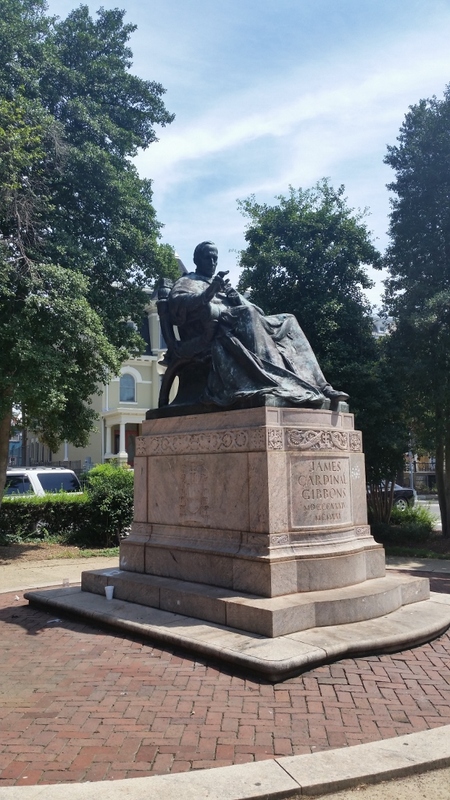 James Gibbons was born in Baltimore. And, although he grew up in Ireland, he came back to Maryland for his education. He was ordained a priest in 1861. Gibbons later became an American Cardinal of the Roman Catholic Church. He served as Bishop of Richmond from 1872 to 1877, and as ninth Archbishop of Baltimore from 1877 until his death in 1921. Gibbons was elevated to the cardinalate in 1886, the second American to receive that distinction, after John McCloskey. The idea of a statue to Gibbons originated with Charles W. Darr, the Knights of Columbus State deputy supreme of the District. 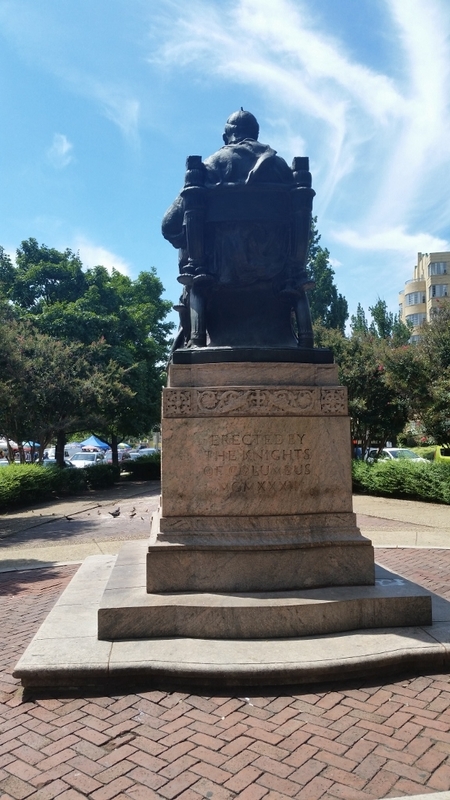 In 1928, seven years after his death, a joint bill was introduced in the House and Senate by Representative Fred N. Zihlman, of Maryland, and Senator Millard A. Tydings, of Maryland, authorizing the memorial. It was unanimously passed by Congress and approved by President Coolidge on April 23, 1928. 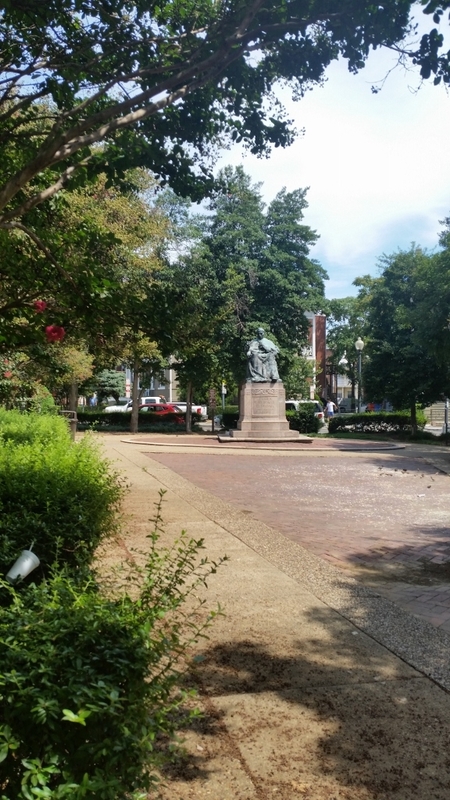 The resolution called for the memorial to be placed at 16th Street and Park Road on Government ground opposite the Sacred Heart Catholic Church. And the memorial was to be funded through contributions from the Knights of Columbus. Because the Knights of Columbus were paying for the memorial they organized the judging of the initial models. 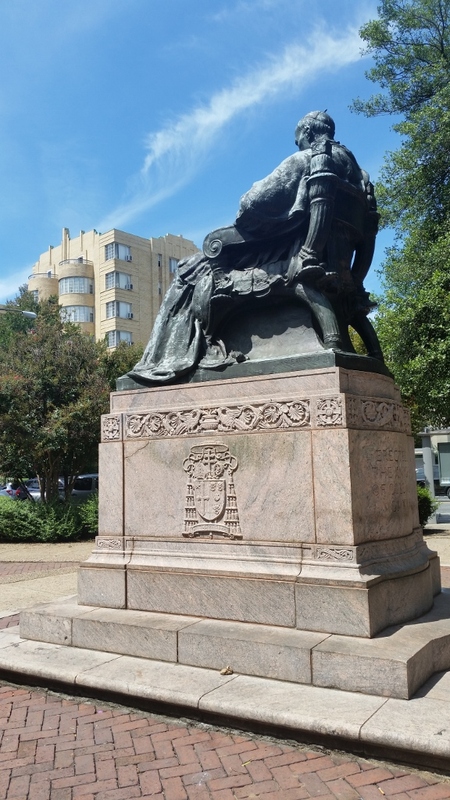 The monument to Cardinal Gibbons was selected from a group of five models submitted by leading sculptors and approved by the Knights of Columbus committee for the memorial and the Fine Arts Commission of the District. The plan for the memorial called for the Knights of Columbus to contribute all the funds for the statue. Radio Dial Flashes. By ROBERT D. HEINL. The Washington Post, 14 Aug 1932: A2.